I hate to admit it, but I love Burger King’s chicken fries. They are a serious fast food guilty pleasure of mine. I only indulge about once or twice per year, usually on a road trip. Each time that I do I feel equal parts satisfaction and regret. I needed answers, so I set out to conduct my own experiment and answer my question. 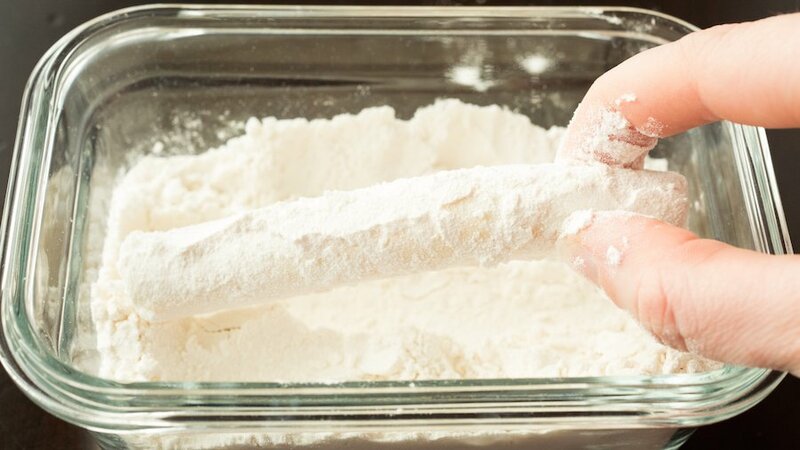 Take a mozzarella stick and roll it in flour…. And drop ’em in the deep fryer! The taste of these actually exceeded my expectations and I am giving them a top spot on my favorite appetizers list! Update! : I made a version of these that are breaded in Flamin’ Hot Cheetos. Check out the video I made for it. Combine all the seasonings in a small bowl. Pour over ground chicken and mix with your hands. 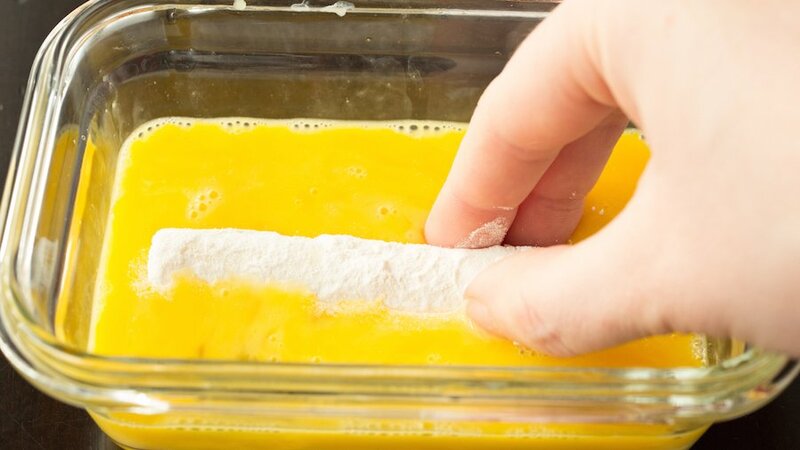 Line up four bowls: one with the flour, one with the eggs, one with ground chicken and one with the seasoned bread crumbs. 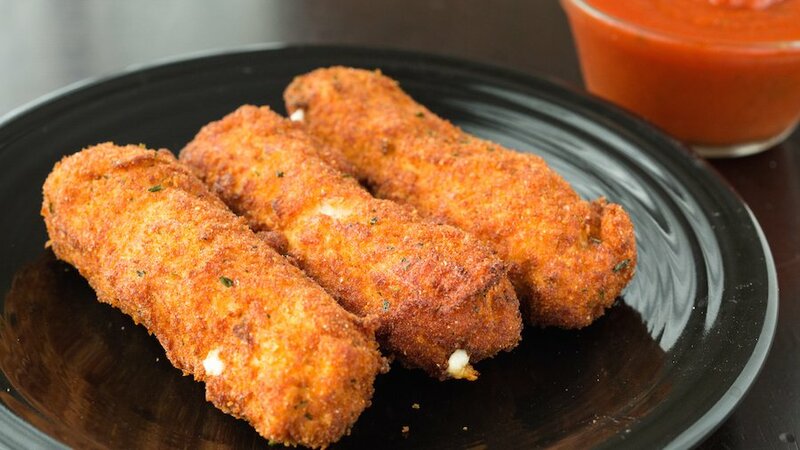 One at a time, take each mozzarella stick and roll it in the flour, dip it in the egg, cover in ground chicken (try to cover as evenly as possible), then roll and cover in bread crumbs. 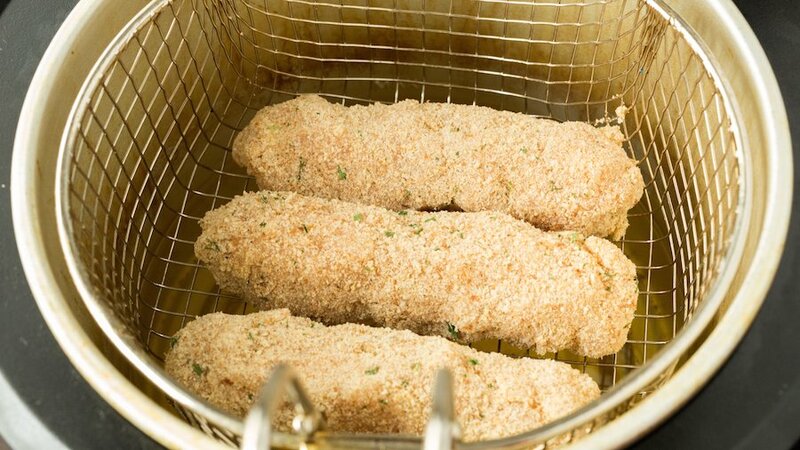 Deep fry for 3-5 minutes, until golden brown and cheese is beginning to ooze out. Serve with a side of marinara sauce and enjoy! I got a little disappointed when realizing this was ground chicken instead of perhaps a pounded out chicken tender ? Well chicken nuggets are essentially ground chicken with spices, just like this. If you pounded out a nugget, even if you could get it wrapped around and molded to the cheese, it would be tough and overcooked when fried. We made these this weekend and they were AWESOME! Thanks for the recipe. The seasoning for the chicken tastes really close to BK chicken fries, great job! Would it be possible to bake these instead of frying them? Oh my gosh, this looks so incredibly delicious! 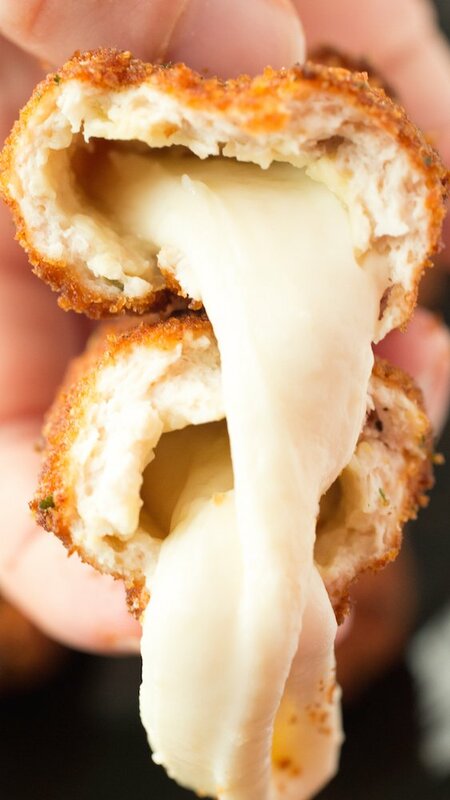 Chicken surrounding cheese. Yum!! These are kinda genius! Love a good guilty pleasure treat now and then! 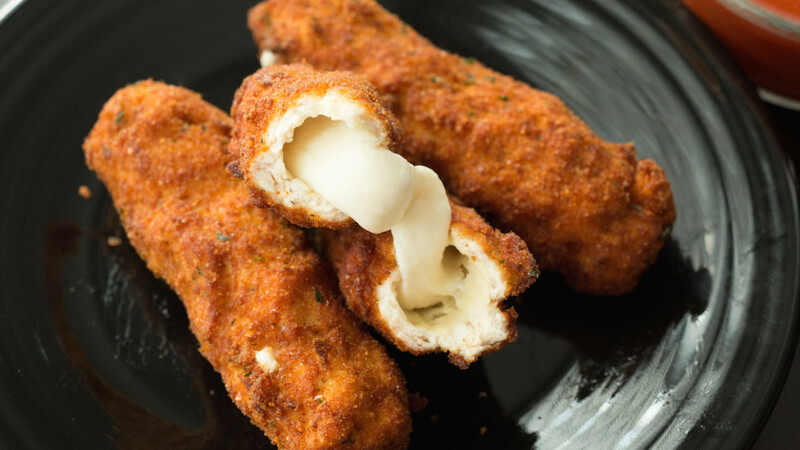 Mozzarella sticks are one of my fast food guilty pleasures, too… this is next level!! Love the video, too – makes it look so easy! These not only look great but they taste amazing you should try it!!!!! That sounds awesome, Cary! I will definitely try out that version on my low carb diet. Thanks for sharing. Your welcome Jessica, i would also suggest ground pork rinds as a breading. Would it be possible to bake these? If so, at what temperature and for how long? These lived up to the rating, loved these. Following a low carb diet and two of these were perfect for dinner with a low carb marinara. Also, first time using the Cool Daddy deep fryer (about $33.00 on Amazon) and it is so worth the price..
Can these be frozen after they are made? I have never tried freezing them, but I don’t see why you couldn’t. If you try it out, please let me know how it goes. I made these in the air fryer and they were pretty good. I sprayed with olive oil and cooked 400 degrees for 6min, flipped and sprayed with olive oil and cooked for another 6min.